apart from which we cannot understand ourselves. You know how I feel about road trips. Very positively. And the upside to working as much as the beau and I do is that we really enjoy your time off. Even a single day is really valuable in the way that it wasn't when I was, say, in college, and I needed a whole week to feel like I was getting a break. With our confluence of 30-some hours away from teh hospital, the beau and I and Rowena took a great little day trip on Sunday to explore parts of southern California we'd never really seen before. It was a fabulous mini-vacation, without any of the stress of actually trying to get somewhere. 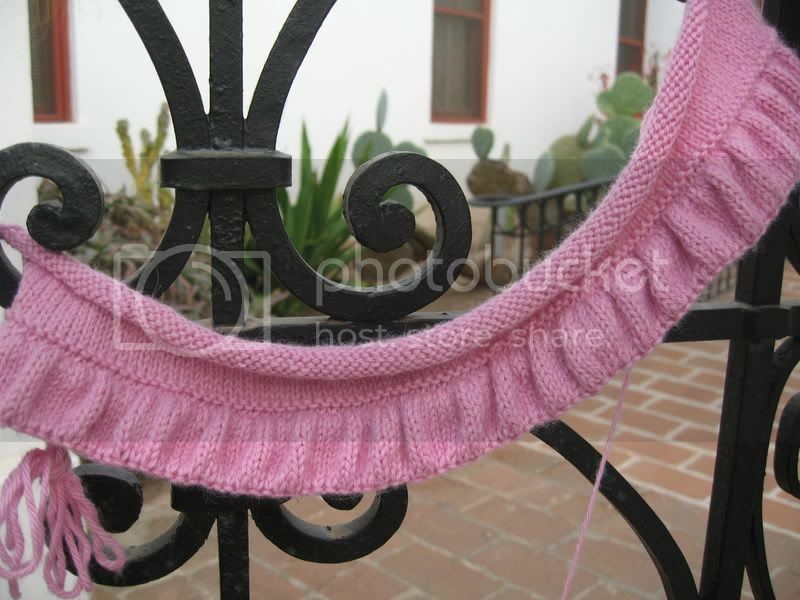 It was so much fun the last time, let's have another contest to guess where the knitting has been. Here's the back of Rowena from Knit 2 Together playing tourist. It's incredible how much stockinette stitch one can knit if the beau drives, isn't it? I started the day at the top of the ruffle and am several inches beyond this photo now. The ruffle is actually a hem, as you may be able to see from the turning row with the hem 1/2 the stitches of the ruffle (which is twice the number of stitches as the body - see how this all works out?). As I usually do, I knit up the hem with the body, which took pretty much forever. Up close, I think it would have been tidier to sew, but from any kind of distance I don't think it makes much of a difference. And the psychological benefit to me is huge. So, where did we go? Here's one last hint. Email your guesses to me by Friday February 2 at midnight Pacific Standard Time (GMT - 8), and the winner will get something wonderfully yarny to be determined next week. Be as specific as you can. I've never knit a ruffle before. Very cool. I have no guesses! I have only been to California twice. 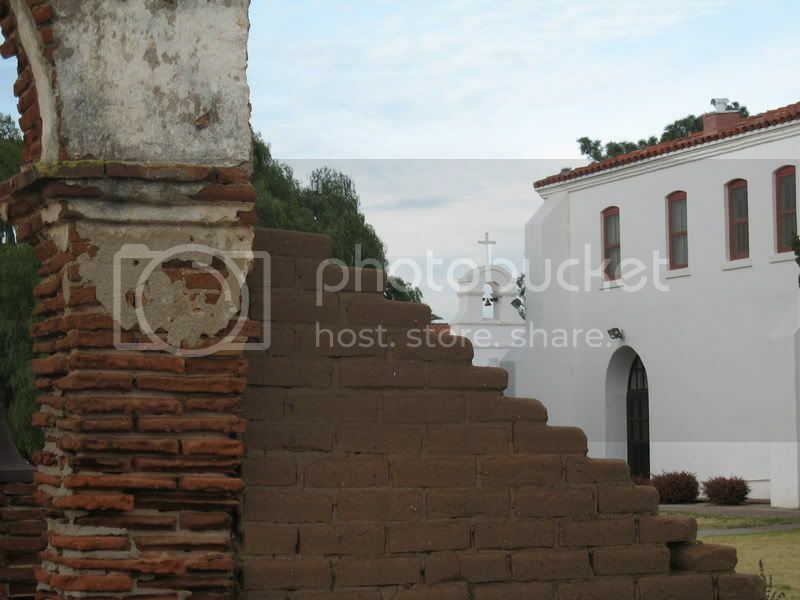 Is it Mission San Juan Capistrano? I'm guessing the Mission San Luis Rey de Francia. Where ever you went, it was beautiful. So's the ruffle. I have no guesses, but both the view and the sweater look gorgeous! I am seriously yearning to make this sweater now (and spend the weekend away). San Juan Capistrano?? Rowena is beautiful in pink!! Lovely Rowena! I especially love the pink, followed shortly by the ruffles!! I've got nothing on the place, but the pinkiness of rowena is delightful! I'm glad you finally got some time off! Whatever mission is closest to you. Nice to see some new scenery! 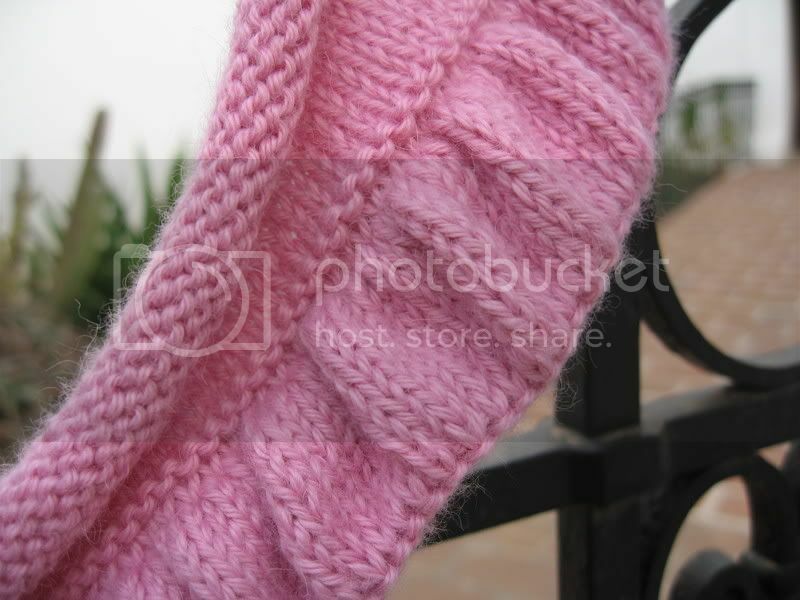 That ruffle is darling and it looks great knit to the hem. Not to mention, done. I love that hem. 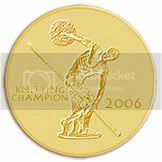 I normally distrust a purled turning row and continue in stst, but having seen your beautiful example, I might try one next time I have the chance! 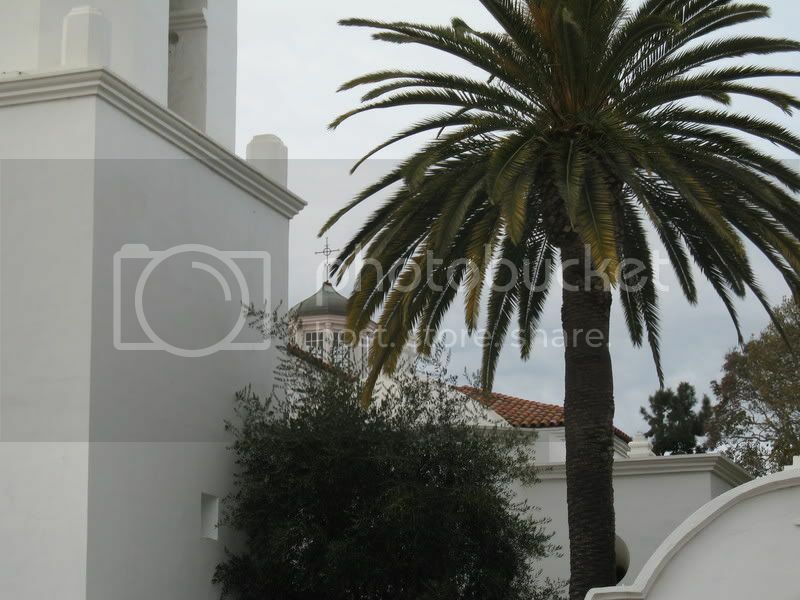 Mission San Luis Rey? I thought San Juan Capistrano at first, but I don't remember there being that much beautiful white. Of course, it's been about 35 years since my parents took us on the Missions of California tour. I'm pretty sure it's not the Santa Barbara or Ventura missions, because I know those pretty well...but whatever it is, it's a very pretty background for Rowena! I totally guessing here because you said you stayed close, and I know Mission San Juan Capistrano has a ton of birds (and I don't see any in your pictures) and is not as white; So my guess is Presidio Park's Mission San Diego de Alcala. It looks like you had a some great time off regardless of where it was! hmmm... i think I need a Missions of Southern California Tour cuz I have no friggen idea and I've lived in So Cal for 6.5 years! Looks a little bit like San Diego State University except for that cross on the building which leads me to think it is an old mission. And, since it sounds like this is a little south of SD then I doubt if my guess is correct. I was all set to go to San Diego State when my dad got transferred to D.C. (sob)...they didn't want to leave me on the opposite side of the country. I'm glad you went exploring and had some time off!